Native to southeastern U.S., northern Mexico. Dark to blue-green leaves, sharply bent downwards with pointed tips, 2 1/2' long and 2" wide. Generally with a single trunk, but can produce offshoots with age. 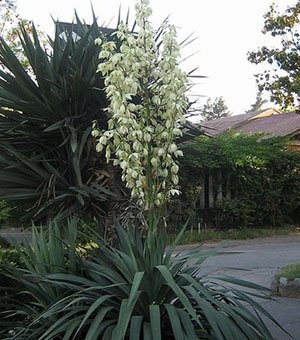 Blooms are white, numerous on a stalk 2' to 5' tall. Tolerant of heat and part shade. Secondary trunks can be removed from the base and healed for a week in shade, then planted elsewhere to make a new plant.